SHIJIAZHUANG, China (CNN) -- The former chairwoman of China's Sanlu dairy was sentenced to life in prison and three others received death sentences Thursday in a tainted milk scandal that killed at least six infants and sickened nearly 300,000 others. 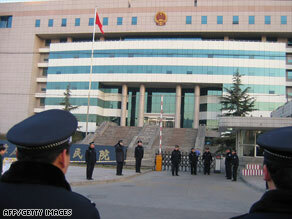 Police surround a court building in northern China in late December during the trial. Tian Wenhua and three other Sanlu Group executives were put on trial for producing and selling fake or substandard products after their arrests in late September. Tian, who pleaded guilty in December, received a life sentence Thursday. Former deputy general managers Wang Yuliang and Hang Zhiqi received sentences of 15 and eight years, while Wu Jusheng, a former executive heading Sanlu's milk division, was sentenced to five years in prison. In addition, Sanlu, Tian and Wang were ordered to pay multi-million dollar fines. The court also sentenced three people to death, including a suspended sentence pending a review, and two others to life in prison. Six more received prison terms of five to 15 years each. A list of sentences handed down by a Chinese court Thursday in China's tainted milk scandal. Security was tight ahead of the verdicts, as police set up roadblocks a kilometer (0.63 miles) in each direction from the courthouse. Parents outside the courthouse were outraged by the sentence that spared Tian's life. A mother who's baby died from contaminated milk said she wanted Tian shot to pay for the life of her child. Twenty-one suspects went on trial late last month. Nine have yet to be sentenced. Sanlu was one of the main distributors of the tainted milk, which caused kidney stones and urinary tract problems in hundreds of thousands of children. "By doing so, they hope to earn understanding and forgiveness of the families of the sickened children."